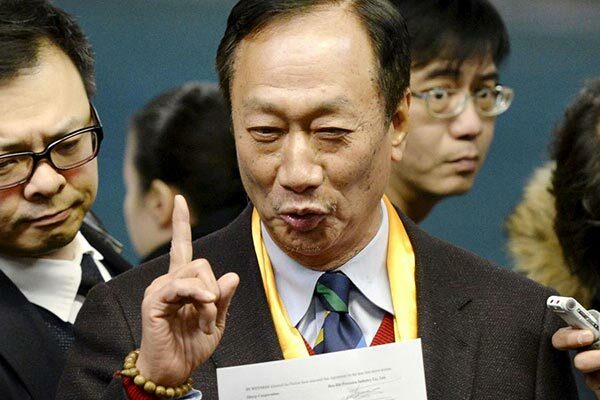 Terry Gou, head of the world[MG_SEO]'s largest electronics supplier, Foxconn, confirmed on Wednesday that he will enter Taiwan's 2020 leadership election. Gou, Taiwan's richest person, with a net worth of $7.6 billion according to Forbes, said he would join the race and take part in the primaries of the Kuomintang party. Candidates are expected to face a slate of competitors in the 2020 election. Current Taiwan leader Tsai Ing-wen of the Democratic Progressive Party has said she will seek a second four-year term. Gou said on Tuesday that he was considering a leadership bid and hinted that he was close to a decision when he told more than 100 people packed into a temple that he would follow the instruction of a sea goddess who had told him to run. "Peace, stability and Taiwan's future economy are my core values," Gou said later at the KMT's headquarters in Taipei. He urged the party to rediscover the spirit and honor of the KMT and to recover support for the party among Taiwan's youth. The KMT said this week Gou had been a party member for more than 50 years and had given it an interest-free loan of NT$45 million ($1.5 million) in 2016 in the name of his mother, which showed his loyalty. Gou, 68, began his career in plastics before branching out into electronics and later mobile phones. Gou gives his age as 69 in keeping with Chinese tradition, which designates a child as 1 at birth. Gou this week said he was planning to step away from day-to-day operations at Foxconn but would continue to guide the company's "major direction" while working on a book about his management philosophy and bringing along a new generation of business leaders.